Machinery Moving has over 100,000 sq. ft. of warehousing space. If you need long term space or just short term space to stage equipment. There are calls that come in daily for us to repair a piece of equipment anywhere from a leaky tank to a large gear change on a mixer. Fork Truck capacities range from 2,000-150,000lbs. We also build specialized rigging accessories such as Booms, Spreader Bars and Specialized Carts. If your company is relocating Machinery Moving will move everything from machines, electrical, and mechanical. We can provide any on-site welding your company may need for a repair or new construction. We are constantly building custom fabrications for customer’s such as platforms, stainless steel tanks, etc. 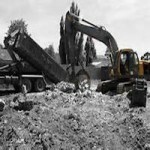 At machinery moving we also offer our customers material removal services. Let us quote your next messy job. Machinery Moving has been providing quality rigging services for almost 50 years. The company was founded in February of 1967 by Max Luther and Don Lienhoop, who remained equal partners until Max decided to retire and sold his half back to the company in 1992. Max did not venture far, however, staying on in retirement as general manager until 2009, when Don decided to retire himself he sold the company to JR Industries. The company changed hands one more time, in 2013 when it was purchased by Mark Thomas of Thomas Plastic Machinery Inc. Mark has 34 years of experience in the rigging industry. Since 2013, Machinery Moving has continued to experience tremendous growth and opened a second location in Indianapolis in April of 2015. I wanted to drop you a line and express my gratitude to the crew. This past weekend we had a major issue at the plant. We lost 2 buss ways. I called them and explained the situation. Our plant is full of equipment and very tight. They showed up early the next morning and had the Buss’s removed and the replacements installed by the end of Saturday. This team has a great attitude and work well together. Please pass along my deep appreciation to this crew. We acknowledge the vital role you played in the success of our project and want to express our sincere gratitude for your participation. We could not have achieved this level of success without your firm’s cooperation and dedication. As we have seen time and again, the most successful projects are the ones where the entire team is focused on not only their role, but also the needs of the other team members. You were a true “partner” on this project, and for that, we are very grateful. We eagerly await the next opportunity to partner with your firm to deliver another successful project. GKN has worked with Machinery Moving several times over the past year. They have handled jobs from large press moves to small CNC lathe moves. They always meet our tight scheduling and have exceeded our expectations. Machinery Moving helps make moving equipment stress free. They have become the preferred rigging company at GKN Salem.